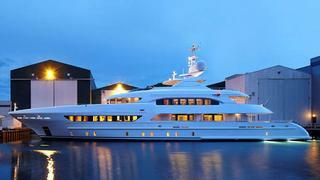 Project Margarita, a newly launched 46.70m superyacht begun on spec at Dutch yard Heesen Yachts, has been sold. The deal was signed on 19 May, 2014, just as the boat was nearing completion at Heesen's facility in Oss. The buyer is a 'seafaring enthusiast who is looking forward to cruising with his family in great comfort and style', according to the company. Margarita is the 10th boat to be launched in Heesen's 47-metre class, but she carries a new style that separates her from her sisterships. Frank Laupman from Omega Architects is responsible for her interior and exterior design, creating an elegant yacht that is bang on trend for having huge, full-height windows wrapping round as much of the superstructure as possible. All this glass will be most effective in the skylounge, offering sweeping elevated views across the water, but this space can also become a cosy enclave, with a bar and home cinema set-up. The master suite is forward on the main deck, and comes with a private study, walk-in wardrobe and central bathtub in what should be a spectacular owner's bathroom. The guest accommodation on the lower deck comprises two double cabins and two twin cabins, all of which get en suite bathrooms kitted out in marble and limestone with polished steel fittings. The sun deck has 85 square metres of deck space – ample space for the Jacuzzi and al fresco dining. Large sunpads forward of the bridge will offer privacy when berthed stern-to in the Med. Zero-speed stabilisers will keep things steady at anchor, with twin MTU 8V 4000 M63s providing the grunt all the way up to the yacht’s top speed at half load of 15 knots. Project Margarita will be handed over on June 30 after sea trials, and she will be on display at Monaco Yacht Show this September.